Molly McCann says she can be the "poster girl" for the UFC in Europe after becoming the first English woman to win on the sport's top promotion. The Liverpool flyweight, 28, bounced back from a debut loss to beat Brazil's Priscila Cachoeira by unanimous decision at UFC London on Saturday. That win came despite fracturing a bone in her eye socket in the final round. "I am still buzzing. I'm walking through the streets of Liverpool like a queen," McCann told BBC Sport. "I walk around with one eye, smiling from ear to ear, and every single person in the street knows who I am. "For people to appreciate... it's like 19 years of work - it's amazing." 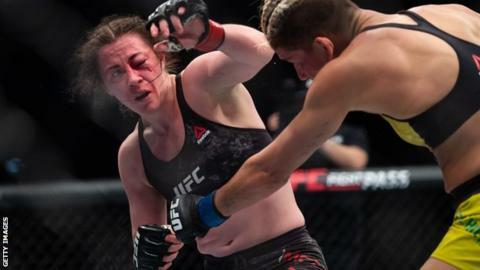 The former Cage Warriors champion had surgery to repair her orbital bone on Sunday and expects a six-week lay off before she can return to full contact. McCann then hopes for two more fights before the end of the year and is keen to feature at the UFC's International Fight Week on 6 July, with American Shana Dobson a possible opponent. "I think maybe three more really big impressive wins and I'll be close to that world title shot," she added. "I don't have to rush in. Now everyone knows what I am capable of. "It will always be: 'This is Molly McCann, she's the first English woman to win in the UFC.' That will stay with me forever and it's got weight to it - there's going to be more about me now." Could you last three rounds with a UFC fighter? 'Meatball' entered the octagon to an electric atmosphere on Saturday, with the majority of fans inside the O2 Arena singing her name throughout the impressive victory. She worked with Liverpool John Moores University to improve her nutrition and strength and conditioning in the build-up after an opening defeat by Canada's Gillian Robertson in May. But it was the manner of the win in London - and the heart shown after her eye swelled over - that earned McCann global recognition. Now the former professional footballer wants to become the first English woman to headline an arena in the UFC. "The UFC hasn't got a European poster girl. They haven't got a British poster girl or an English poster girl until me," she said. "I just think I am the person that is going to make everyone follow it." First McCann, a huge Everton fan who quit football following an injury to focus on mixed martial arts, wants to use her six-week recovery to volunteer abroad. "It's hard to not be humble when you're from Liverpool, but I went travelling when I was younger to learn a bit of humility," added McCann, who spent three months working with the Football Association in Africa when she was 21. "I am a sensitive soul so I always want to help people. "Maybe people don't see that side of me because I am just the loud 'Meatball' - but my life literally consists of the gym, coffee, vinyl and Everton Football Club, and it has been like that for about the past five or six years. "I have been through quite a lot in the past few years, and especially the past 10 months since my last fight. "There have been a lot of mental health issues and I have seen a lot of adversity in the past couple of years, so I think I would like to go and just help some other people."